KSRealityBites: Beansprouts responsible for E.Coli outbreak! 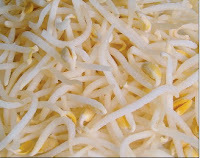 Beansprouts responsible for E.Coli outbreak! E.coli outbreak that has killed more than 20 people across Europe, officials said that German beansprouts are linked to the bug for the food poisoning. The officials 've warned people to avoid the beansprouts, which are used in mixed salads. However, it is not confirmed, but the test results indicate that the vegetable is responsible for causing the E.Coli outbreak. It was found that people suddenly became ill after taking the sprouts. At least 11 people in the UK affected due to food poisoning that us linked to E.Coli. Eight cases diarrhea 've been reported & three people 've been admitted for the treatment of haemolytic uraemic syndrome (HUS). All the eleven people 've recently visited Germany. The WHO said that more than 2,260 cases 've been reported so far. At least 21 people died of the deadly infection in Germany, 15 died due to the strain of HUS & six were the victim of the enterohemorrhagic E.coli (EHEC) O104. At least 31 cases of HUS were reported from Sweden. The authorities of European countries 've ordered their citizens those who 've recently visited northern Germany, to go through proper check up as one case was found in Finland. All the travelers to Germany are directed for the test to determine whether the infections are same as of German people. The authorities 've warned to avoid the vegetable like cucumbers, tomatoes & salad.